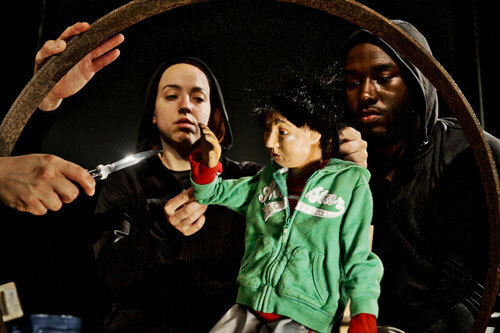 The show is presented by Brookline’s Puppet Showplace Theater at Suffolk University’s Modern Theatre in Boston from Jan. 24 to 26. Each performance is followed by a conversation with local refugee advocates and Boston community leaders. 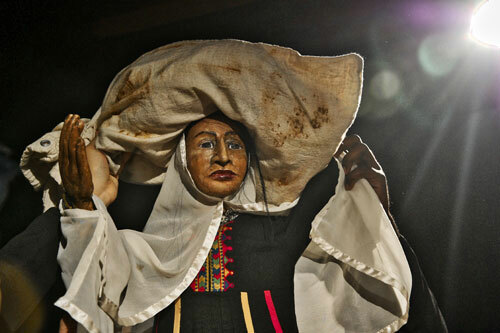 Sandglass Theater is known for “combining puppets with music, actors, and visual imagery.” This is puppetry as part choral singing, part slam poetry, part experimental theater spectacle. 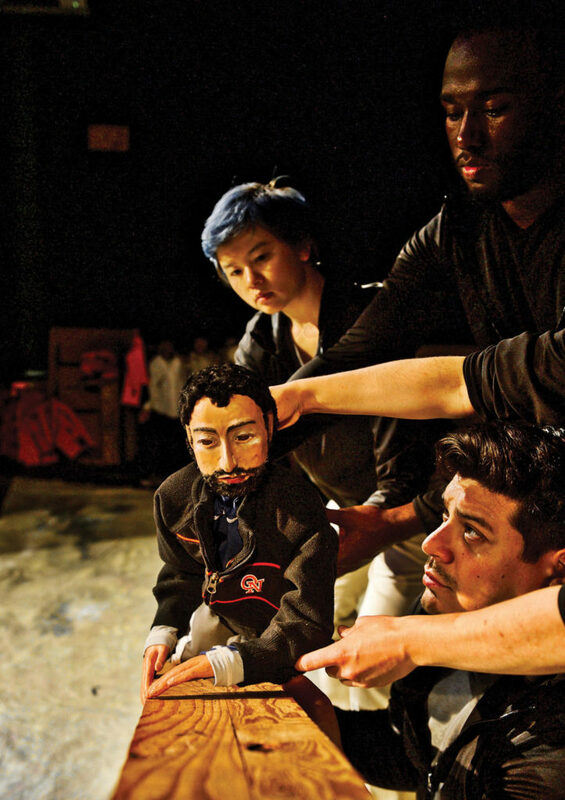 These puppets are life-like sculptures of people, a few feet tall, operated by rods in the arms and a handle at the back of the head, animated by a cast of five performers (Shoshana Bass, Keila K. Ching, Kalob Martinez, Raphael Sacks, Alan White) in full view of the audience. “Babylon” begins with a montage of puppets running, balancing, being tossed about as images, tableaus appear and dissolve. 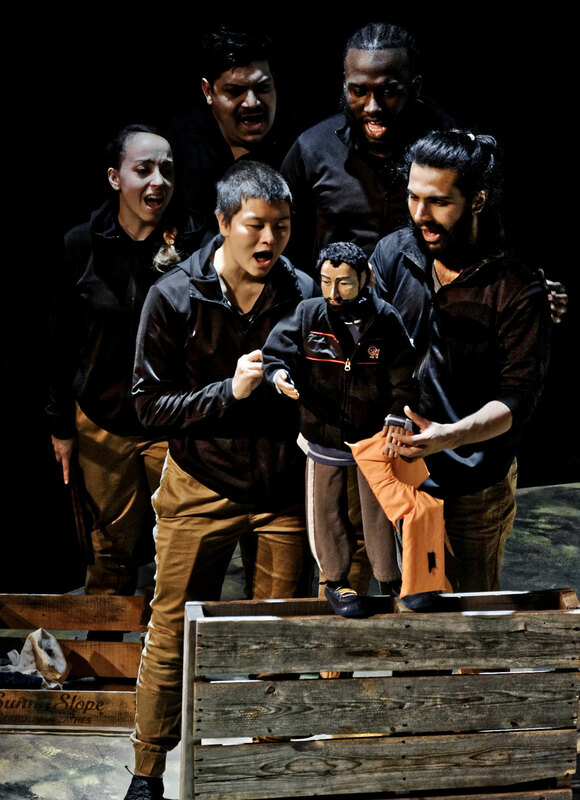 Throughout the show there are visions of puppets are caught in a border fence like a net; refugee camps; rafts; a beating and torture; a caterpillar crawling across the floor; men with rifles, long lines of refugees snaking crossing wastelands. “When you walk long enough, when you walk far enough, do you leave a life behind?” the cast sings. A friend introduced them to Amila Merdzanovic, director of United States Committee for Refugees and Immigrants in Vermont, which led to opportunities to speak with refugees resettled in Vermont.